One of the things that I think most home decorators find difficult is creating a home that doesn’t look like it came out of a catalog but that still has a sense of flow. More on that topic in future! I was going to post my small bedroom storage trick this week, but after seeing Dana Gibson’s recent home tour reveal, I had to write about it! 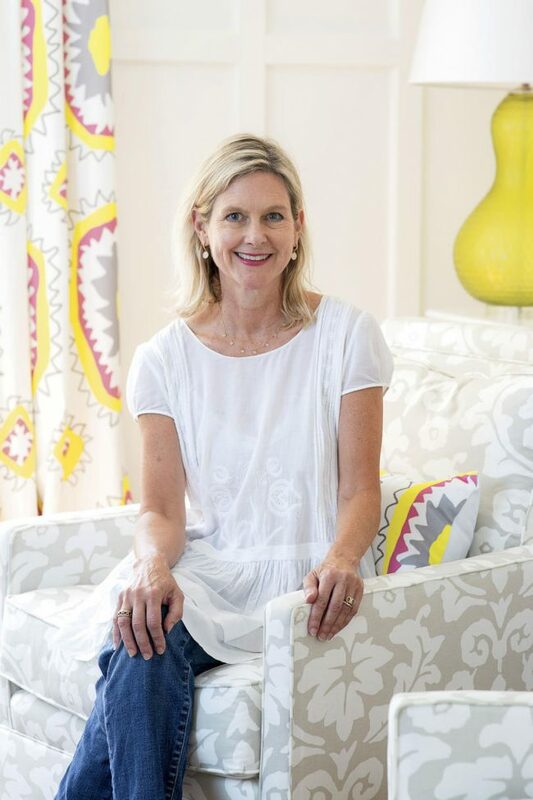 Dana Gibson is an interior designer and artist known for her fearless use of color in home decor, creating sophisticated yet light-hearted accents like pillows, art, lamps, waste baskets, dishes, etc. beloved by other interior designers the world over. Her mother is a painter, her grandmother was a sculptor, and her great-grandfather, Charles Dana Gibson, was the creator of the “Gibson Girl.” Quite the artistic pedigree! All images by Helen Norman for Southern Living Magazine. Dana Gibson in her living room. And she has a line of furniture through the MT Company. She brought all that ingenuity to her Richmond, Virginia split-level. Dated and depressing when she and her contractor husband, Mark, first purchased it, its 8-foot ceilings, fake wood paneling, and complete lack of interior architecture could have sent even the most seasoned house-flippers running. But Dana is a creative, after all! She and Mark ripped off the paneling, pulled out the carpet, and painted everything white for a fresh start. They then used a designer’s builder-upgrade secret weapon — moldings — and began adding back in color and pattern. The entry hall was once dark and depressing, clad in faux-wood paneling. Dana uses her own products throughout her home, soulfully mixed with antique and vintage finds. Here, she used her Peregrine wallpaper in between newly applied moldings to create an interior architecture previously lacking. 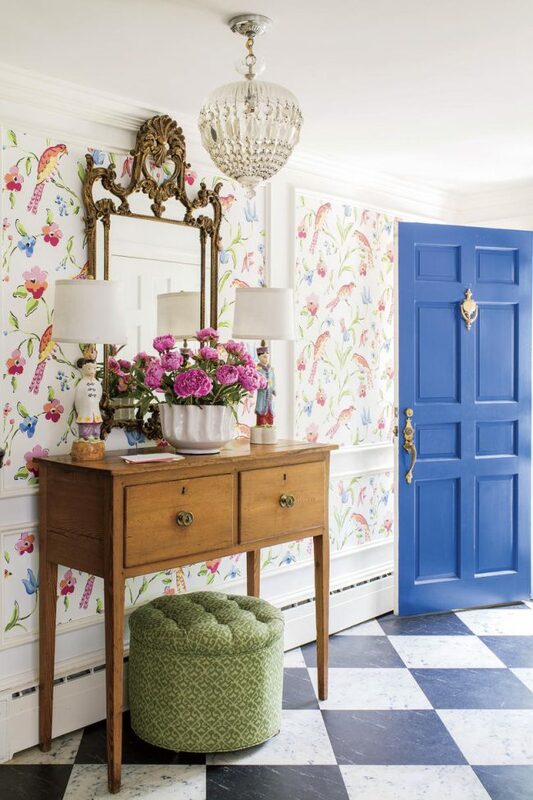 The front door is painted Benjamin Moore’s Blueberry Hill 812. 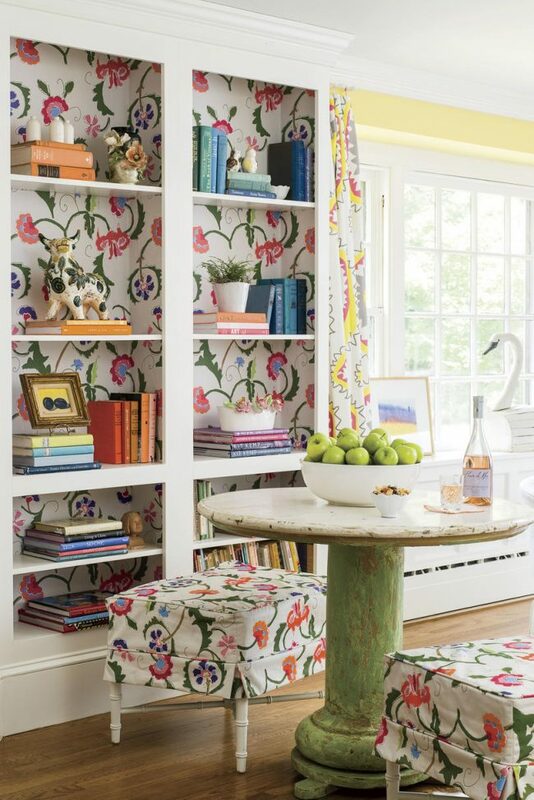 My favorite room is Dana’s living room, which is so sunny and cheerful and anything but garish! The weather is 34 degrees and icing/raining/snowing here, so I’m definitely chasing sunshine. Overblown, large-scale patterns are spaced out with solids and small-scale combinations. LOVE the yellow, which is repeated in the lamps and just a bit in the fabric on the drapes and lounge chair pillows. What we have here is that pleasing color proportion of 60/30/10 — in this instance, 60% neutral, 30% yellow, 10% blue. With a touch of raspberry. Similar lounge chairs in the same Dana Gibson grey patterned fabric here. Dana’s use of pattern-on-pattern is completely unabashed in her dining room, but the passage of color from the living room into the dining room works because, whereas solid color was used on the walls in the adjacent living room, patterned neutrals are on the walls here. Also, the berry red from the pillows in the living room can now be found in greater density in this space. Similar Dana Gibson chandelier here. This is a gorgeous French farm table. I love this little jewel box “moment.” Dana put her vanity in a closet (so she can shut the doors when it gets messy) and clad it in fuchsia wallpaper. More vintage finds. Have you noticed a little thread of berry reds that have traveled through the house? A clean white palette of shiplap and marble in the master bath. This light fixture is by Ro Sham Beaux. 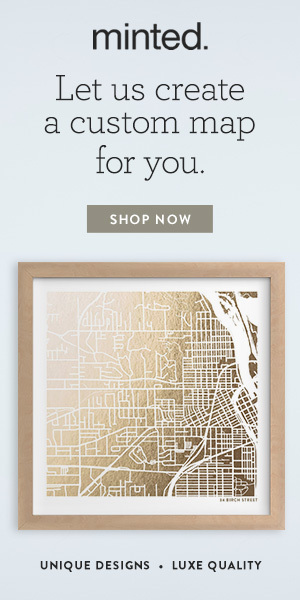 (I love Ro Sham Beaux, but this Etsy Shop makes similar for about half the price.) Similar table here. The bedroom is a twist on classic blue and white, with a Mexican folk art cabinet, chartreuse green lamps, and more of Dana’s own fabrics and vintage finds. The white backdrop and mix of pattern scale keep it all in balance. You can see the whole tour — including the amazing BEFORE pics — at Southern Living. Need some sunshine in your decor right now, like I do? You might like this post. Last weekend, I (or rather, my web guru) changed the blog over to a new server, so I apologize for the missed post. Next week I’ll be back with that bedroom storage tip. See you Saturday!